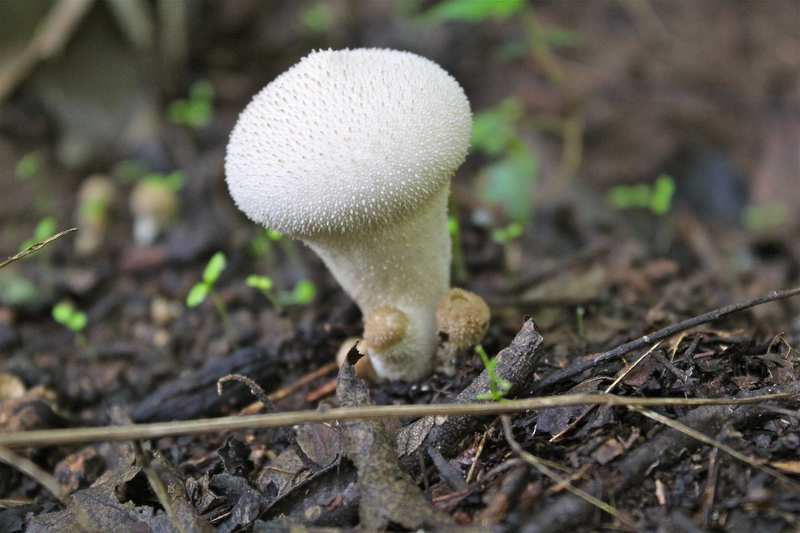 “This mushroom, popularly known as the common puffball, warted puffball, gem-studded puffball, or the devil’s snuff-box, is a species of puffball fungus in the family Agaricaceae. A widespread species with a cosmopolitan distribution, it is a medium-sized puffball with a round fruit body tapering to a wide stalk. It is off-white with a top covered in short spiny bumps or “jewels”, which are easily rubbed off to leave a netlike pattern on the surface. When mature it becomes brown, and a hole in the top opens to releasespores in a burst when the body is compressed by touch or falling raindrops.